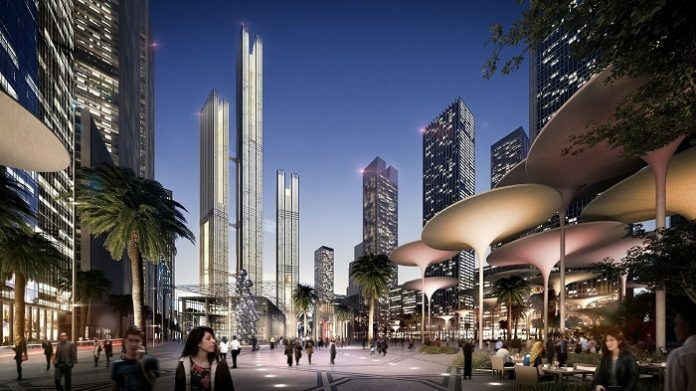 Egypt will construct Africa’s tallest skyscraper as part of the new administrative capital project. The new building will be worth a whopping US$ 3bn. State-owned China State Construction Engineering Corporation (CSCEC) is the company behind the project. It will develop the 345m-high skyscraper and once complete it will replace South Africa’s 223-meter-tall Carlton Centre. The development will also comprise of 12 business complexes, five residential buildings and two hotels over half a square kilometer. In total, the new capital will cover an area of 50km. The Chinese ambassador to Cairo, Song Aiguo, explained that the project comes in line with China’s strategic One Belt One Road Initiative. The initiative carries on the vision of the ancient trade route of The Silk Road, with a bold plan to connect China to the entirety of Asia and the eastern parts of Africa and Europe through six routes. Additionally, the ambassador extensively said that the project will symbolize Egypt and China’s mutual cooperation for future generations. It will also enhance their bilateral relationship. Earlier, Egypt sought to develop the project with a Dubai real estate company before reaching a deal with the Chinese developer. China and Egypt who have raised the level of their ties to a comprehensive strategic partnership enjoy strong and growing ties. The ties are not only politically but also economically and culturally. They recently celebrated the 60th anniversary of their diplomatic ties in 2016, which was marked as the China-Egypt Cultural Year. CSCEC is China’s largest construction and real estate conglomerate and biggest building work contractor. It is the largest transnational construction company in the developing countries. Also, it is the top home builder in the world, taking the long lead of China’s international contracting business. China Construction is well known in the world for undertaking super high-rise, grand scale, cutting-edge and novel projects. They have built up a great number of landmark projects in China and around the world including Africa.